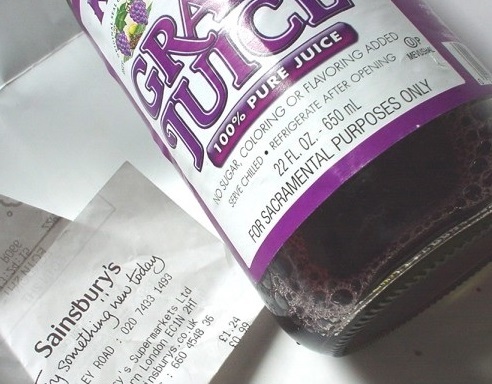 I recently noticed that the bottle of Kedem Kosher grape juice that I purchased has a notice on the label which reads 'FOR SACRAMENTAL PURPOSES ONLY'. I assume this means that it's being sold to be used only for Kiddush, Havdalah or the Four Cups at the Seder. Why is it in the company's interests to sell it in this way? Does it confer some legal, regulatory or tax advantage? The reason is to exempt it from Value Added Tax. See the regulation at this www.gov.uk site. "Zero-rated" means that there is a zero rate of Value Added Tax. I'm not good enough at reading legislative mumbo-jumbo to completely understand the particulars of the section in question, but New York state has a law (the Alcoholic Beverage Control Law) which specifies certain restrictions on alcoholic beverages. Section 6 in particular deals with wine. I don't know for sure that this law is the reason Kedem puts this disclaimer on the bottles, but it seems plausible to me that they do it just to avoid the possibility of legal mix-ups even though it may not be strictly necessary for non-alcoholic beverages. There is a section in the law (76(10)) which makes an exception to some of the restrictions for sacramental purposes. Someone who is better at reading these kinds of things may be able to clarify the law better than I can. Not the answer you're looking for? Browse other questions tagged kashrut-kosher grapes-wine kiddush . If a product with a Hechsher doesn't say dairy does that mean it's pareve? Why is kosher wine or grape juice rare alone but less so as an ingredient? What defines a non-kosher restaurant for purposes of maarit ayin? Source that tzaar baalei chayyim only applies to kosher animals? Why isn't Amaretto Kosher for Passover?